We have worked together with Ciranda Inc. in the United States since 2011 and since then North America has become one of our most important markets for organic potato starch. It is because of the great work Ciranda is doing to develop the North American organic food market but also because the market trends are favorable to potato starch and American consumers and processors are becoming increasingly aware of the advantages of potato starch as a pure, gluten-free and GMO-free product that in most applications where water binding and viscosity is needed has better functionality than other starches. Hans and Joan Friese at the organic starch potato field together with farmer Matti Ahonen and Finnamyl’s agronomist Kimmo Pusa. This year Hans and Joan Friese from Ciranda Inc. – who are celebrating 20 years in business as a company – visited us to see for themselves the potato harvest and starch campaign in Finland and Latvia. We started with visiting Kokemäki some 200 km north-west from Helsinki and one of Finnamyl’s organic contract farmers: Matti Ahonen. Matti Ahonen has an organic farm with 90 hectares (almost 200 acres) of arable land of which 9 hectares is organic starch potato cultivation. 8 ha is contracted to Finnamyl while 1 ha is for seed potato. Each year the contract farmers receive pure seed potato from Finnamyl from which they grow their seed for the next season. This is a key factor for the crop’s health. This year the summer has been favorable for potato cultivation and the potato is still growing in the first week of September. In wetter summers late blight would already have hit the organic potatoes. The only ways to control late blight in organic potato cultivation are crop rotation, pure seed potatoes and choice of variety. “Kuras” has proved to be the best variety for organic starch in most conditions. The starch is washed with pure water at the belt filter. After visiting the Ahonen’s organic farm we went to see how the potatoes are transformed into potato starch. The first batch of organic potato starch for this campaign was produced last week so what we were looking at now were conventional potatoes. However the process is almost identical. 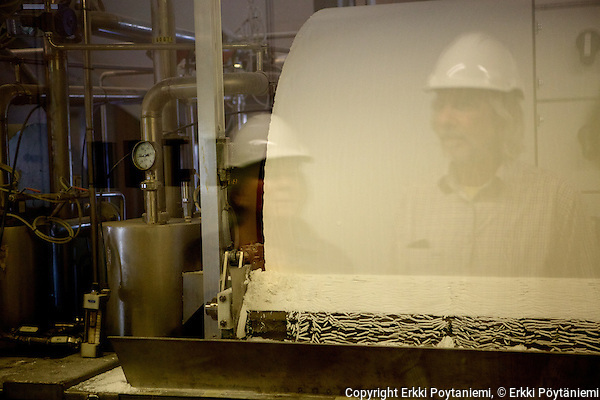 You can see the story of my visit to Finnamyl during an organic processing day in 2012 in an earlier posting. Finnamyl will produce the second batch of organic starch next week. The capacity of Finnamyl is about 25000 tons per campaign which means that all the organic starch is produced in just 2 days. After further washing with hydrocyclones the starch is dried with a vacuum filter and after that with a hot air drier. 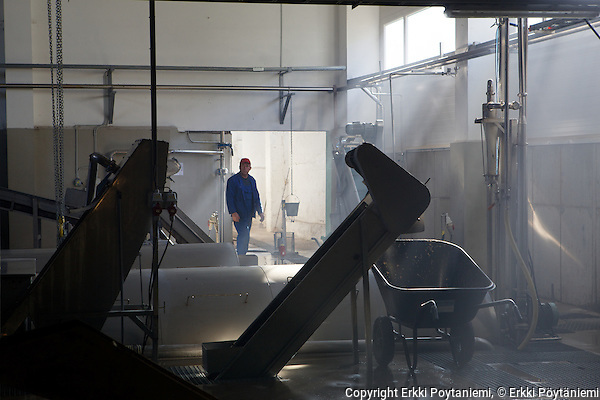 After a night in Helsinki we took the ferry from Helsinki to Tallinn and drove south for visiting also Aloja Starkelsen’s potato starch factory in the village of Ungurpils in northern part of Latvia. 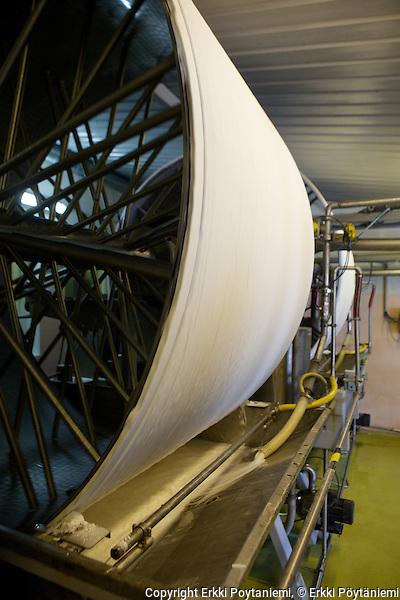 The process at Aloja Starkelsen – and pretty much all European potato starch manufacturers for that matter – is almost identical to what we saw at Finnamyl. Quality differences between factories are small but as always it is possible to improve. At Aloja Starkelsen this year’s investment was to renovate the washing process of the potatoes. 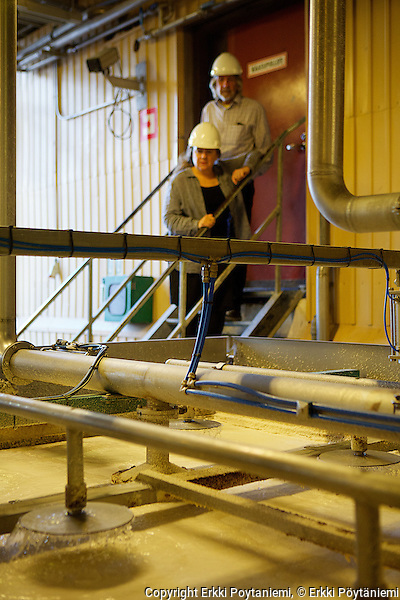 As a factory Aloja Starkelsen is smaller than Finnamyl and therefore organic potato starch is produced every week. This gives also more flexibility to the production in terms of different customer requirements. For example this year Aloja Starkelsen has acquired GMP+ certification which is required by some feed manufacturers and NOP certification. The later is not required anymore for direct sales to the USA but it is still needed if a third-country customer (i.e. a customer outside the EU and North America) wants to export their final product to the USA. In such cases all ingredients need to be NOP certified and the EU – USA organic equivalency agreement doesn’t help. 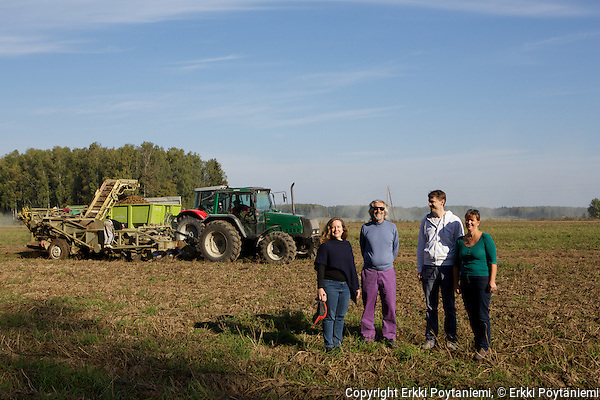 Joan and Hans Friese on the organic potato field of Zigmars Logins during harvest together with Aloja Starkelsen CEO Janis Garancs and agronomist Aiga Kraukle. We also visited Aloja Starkelsen’s largest organic contract farmer, Zigmars Logins, who has 45 hectares of organic starch potatoes this year and was busy harvesting when we visited the farm. Two potato harvesters were digging into the potato field and 3 tractors were taking the potatoes to the warehouse where the potatoes are cleaned and then delivered to Aloja Starkelsen. Also in Latvia the summer has been good for potatoes and a better than average harvest is expected. As at Matti Ahonen’s farm in Finland, also here “Kuras” is the preferred variety and the seed potato is renewed every year. 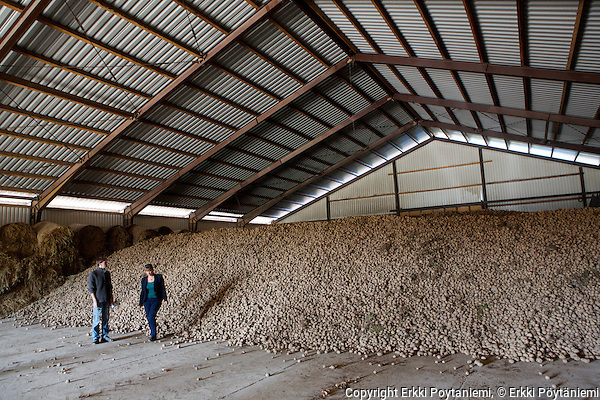 Organic farmer Zigmars Logins with agronomist Aiga Kraukle at the farm’s potato warehouse. 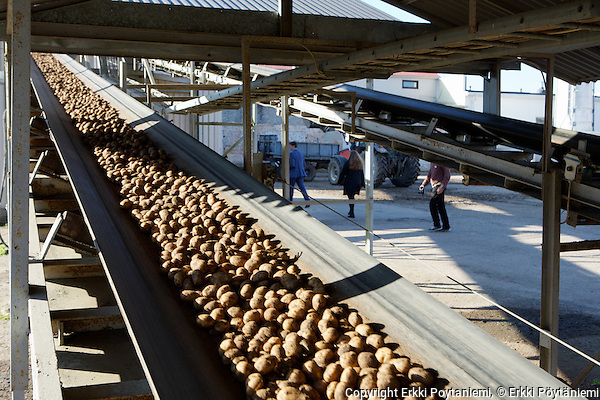 The potatoes are cleaned at the farm before delivery to the factory. Potatoes transported into the factory. The newly renovated cleaning sector at Aloja Starkelsen. The starch “milk” is fed onto the vacuum filter. 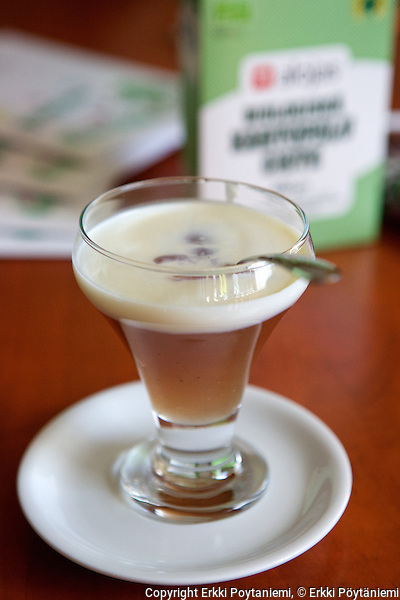 Kiissel is a well known potato starch and berry based desert from Eastern Europe and well known both in Finland and Latvia. Today it is typically bought by the consumer as a dry mix – a product in our consumer line. Organic potato starch – is there enough and where does it come from?